Read the press release announcing the report's findings. The Knight Commission on Trust, Media and Democracy's groundbreaking report, “Crisis in Democracy: Renewing Trust in America,” puts forward solutions for the sharp decline in trust in democratic institutions, including the media. Issued unanimously, the Commissioners’ recommendations apply broadly to journalism, technology, and citizenship, and lay the groundwork for rebuilding trust in the 21st century. Each Commissioner comes at the issues from a different perspective, life experience and value set. Yet we were all able to agree on these principles and proposals. We are particularly proud that this Commission modeled what we hope America can do more of: come together, listen to the other, find common values and common ground, and move forward with goodwill and ambitious aims. Some of the Commission’s recommendations are specifically intended to encourage this kind of civic deliberation to take place more often, across political, geographical and class divides. That is our message, one that we hope all Americans commit to pursuing in the years ahead regardless of their political viewpoints and the particular issues facing their communities and nation. This report has two parts. The first defines the issues and establishes the context. The second sets forth a series of unanimous recommendations addressed to government, media executives, business leaders, journalists, political leaders and every citizen. That said, we each have different opinions on particular details that we hope to expand on in the days and years ahead. We also note that while each of the Commissioners supports these measures, the organizations for which they work do not necessarily endorse every point. We have many to thank for bringing us to the culmination of this report. We do so in the Contributors to the Knight Commission section at the end of the report. 1. Practice radical transparency. The media should develop industrywide, voluntary standards on how to disclose the ways they collect, report and disseminate the news. The Commission calls for a convening of news leaders across competitive boundaries to work together to develop and adopt common standards and best practices that promote transparency. 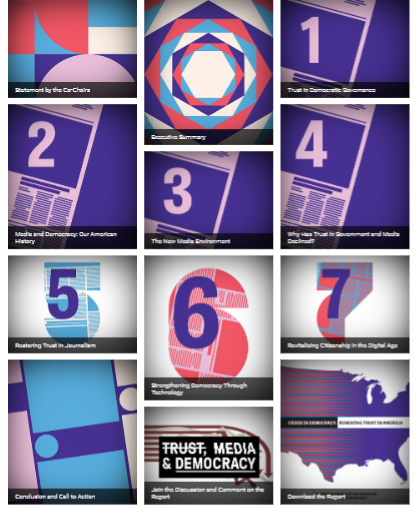 These include: labeling news, opinion and fact-based commentary; best practices on corrections, fact-checking, anonymous sources and tracking disinformation; and avoiding advertising formats that blur the line between content and commerce. They should also develop strategies to better engage with the public and reflect the interests of their communities. 2. Expand financial support for news. There are some promising new models for funding for-profit journalism. But market solutions alone are insufficient to provide the quality of journalism that citizens need and deserve, especially news about local communities. Philanthropy should increase its support for journalism in the public interest. The Commission focuses on the development of new nonprofit models to achieve sustainability and to serve journalistic missions. It calls for the creation of one or more national venture philanthropy entities dedicated to funding new and existing nonprofit organizations across the country. 3. Use technology to combat disinformation. To remain relevant, the media must learn to use advanced technology in all aspects of their businesses. Some of the larger entities are leading this effort, but many more need to catch up. In particular, the Commission urges media and technology companies to improve technologies to determine and then address disinformation. The media should also expose their audiences to diverse viewpoints, understanding the tendency of new media environments to create and amplify “filter bubbles” in which people tend to view only material that already supports their opinions. 4. Diversify news organizations. News organizations should adopt recruitment, hiring and retention practices that increase diversity of staff, and even of owners. Newsrooms should develop mentoring and training programs that can help enlist, retain and promote more women and journalists of color at all levels. And they need to include other underrepresented groups, such as underrepresented geographical and political groups, so that the reporting they produce reflects the entire community. The Commission also challenges all news organizations to develop and publish metrics for hiring and employment in newsrooms. 5. Online services must take responsibility for protecting their users. In other areas of American life, professionals and businesses such as doctors and accountants that have access to personal data about customers commonly have a “fiduciary duty” to protect their interests. To complement privacy legislation and enforcement, the Commission supports proposals that technology companies and online services become “information fiduciaries.” As fiduciaries they must act in a trustworthy manner by ensuring security of user data, keeping it confidential and not using it for their own benefit in ways that compromise the interests of the user. 6. Online services should track and disclose sources of information. Online platforms should develop technology and standards to disclose to their users where the information they see comes from—identifying the author and publisher of articles, for example. In addition, the Commission encourages the development of an automated tracking system that would enable analysis on the original source of a story, as well as how it spread to the public. The Commission also recommends that the sponsors of all digital advertising be clearly identified. This requirement should apply particularly to “native advertising,” which looks similar to independently produced editorial content but is paid for by a third party. Finally, the Commission recommends disclosure of information regarding the targeting of political ads intended to affect attitudes toward a political issue. 7. Empower people to make technology work for them. The Commission recommends that researchers develop ways to measure healthy dialogue online. These include creating metrics to help analyze balanced, democratic discourse. It recommends that internet platforms provide people with information about how algorithms work that determine which information they see, as well as opportunities to customize them. It also recommends enabling people to move their data from one social network to another. And it proposes a multi-stakeholder forum for technology, journalism and consumer interests to work out solutions to a variety of issues that arise in this space. 8. Provide students of all ages with basic civic education and the skills to navigate online safely and responsibly. Too many Americans lack an understanding of basic elements of their government and governing principles. Before they graduate from high school, all students should be able to pass the U.S. citizenship exam or a civic knowledge test. Furthermore, individuals who lack digital literacy skills are less able to assess the reliability of information sources in order to tell fact from fiction. They are easier to harass, mislead or defraud online. They can find it harder to gain knowledge, pursue education or careers, stay healthy, protect their rights and help their communities improve. State and local educational authorities need a plan to provide their citizens with the skills to access, analyze, evaluate, create and act on digital information based on new standards for civic and 21st century literacies. Prior to participating in social media, every child should have a basic understanding of digital media and how to use them safely. Before reaching the legal voting age of 18, individuals should be digitally as well as civically literate, able to find and use information necessary to be knowledgeable voters. These goals should apply to everyone, no matter their income, where they live or what their background. 9. Reach across political divides. The Commission recommends that communities develop programs hosted by trusted local institutions to convene dialogue among citizens. These exchanges should address important questions ranging from local issues to relevant constitutional questions. Public libraries are one obvious place for such discussions. The Commission also recommends the development of public awareness campaigns to encourage people to participate in civic institutions. 10. Encourage a commitment to a year of national service. As politics has become increasingly tribalized, citizens have lost a shared American narrative and a sense of citizenship. To address this, the time has come to revitalize efforts to encourage a year of voluntary national service. The Commission identifies four primary areas in which national service could help renew trust in our democratic institutions and particularly in the press: general civic service; teaching traditional and digital literacy; engaging in public service journalism, particularly at the local level; and serving in libraries. Efforts can be inspired by existing programs, such as the Service Year Alliance, AmeriCorps and Report for America.